Did you ever try to set up a meeting, then drew a blank when trying to determine the perfect place? Who has rooms available? How big are they? What are the fees? It can be maddening, especially when there are so many places ready and waiting for you to use. At least 27 places, according to some interesting information just collected by the League of Women Voters. Margit Johnson of the League sent along the complete list, which you can download here as either a Word doc or a PDF file. "The impetus for this list came from a meeting at the Public Library last summer. That meeting room is constantly in demand while other meeting places are underutilized. Also the LWV thought that community members would appreciate a "one-stop shop" resource for information about locations, capacity, contact numbers, and details. We hope that you and others find this list useful. Updates will be forthcoming as needed." The Northfield Downtown Development Corp. (NDDC) will present its monthly Downtown Forum on Tuesday, Jan. 9, with a panel discussion that examines retail vitality on the main street of Northfield in the wake of the recent closing of Las Delicias restaurant on Division Street. Editor's note: You can catch up on the las Delicias story here. Among the topics to be covered: rental rates, the community’s responsibility to businesses and businesses’ responsibility to the community, high property taxes, the cost of maintaining and expanding historic buildings, the viability of available financial tools and how downtown can function as a business incubator for the larger community. We (Grezzo Gallery) opened January with "scrap" last night! The show runs through January and features scrapbookers from all around Minneosta and even from all around the nation. The doors opened last night at 6 pm. We had Wes Thomsen in the house to screen his documentary, Scrapped. Wes is a local film maker, and I hope now a good friend. We had a packed house, somewhere up towards 70 people at one time (we can't fit any more than that in our gallery). After the movie Wes answered some questions and people stuck around to check out some of the scrapbook art on display and to mingle with other scrapbookers including some from the movie. I want to thank the Northfield Arts Guild and the Archer House for letting us use some of their chairs, and the Art Store for giving us props to stage our window. Please visit these businesses in our community and show support for the local business owners! Update (01/02): The Star-Tribune weighs in on this complicated and emotional story with its own reporting here. Update (12/28): More information and discussion on Locally Grown including response from the landlord and links to background information. Many Northfielders will be surprised and sorry to hear that Las Delicias - the restaurant in the Ideal Cafe space - has posted a notice saying they will be closing on December 30. The Barrientos family has operated the restaurant for more than seven years. They have been on a month-to-month lease, not only for the restaurant space, but also for the family's apartment upstairs and the landlords have chosen not to renew the leases into 2007. The loss of Las Delicias is a blow to a family that has contributed in many ways (and not just the good food) to the Northfield community. It is also a loss to the community. Tonight, Kim Bloom will be entertaining folks at The Hideaway with his classical guitar from 7 to 9 p.m. The Hawthorne Palace Band plays at the Tavern starting at 8 p.m. Or you could head to Dawn's Corner Bar in Dundas on for their New Year's Bash with Harmonic Voodoo. On New Year's Eve, Bjorn to be Wild will be entertaining those ringing in the new year at the Contented Cow. There's so much going on in town this weekend that we couldn't even get this post online in time to cover it all! You may have missed Kim Bloom at the Hideaway last night, and Norwegian Cowboy at the Tavern, but you'll get another chance when they return next weekend. Tonight at The Grand, CBO will fill the dance floor with little big band boogie – I’m counting 11 members in their publicity photo. Doors open at 8:30 with a $10 cover charge (less than $1 per band member! ), and you can reserve holiday dining before the show by calling 663-1773. Spend your Saturday downtown shopping the fine shops of Northfield, after you get your exercise with the Jingle Bell Run. Just Food Co-op is celebrating their 2nd Anniversary from 12-3, and at 2 p.m. Doug Ohman is signing books at Monkey See, Monkey Read. Then there’s a high school concert choir at Carleton at 7:30, Anthony Newes at the Tavern at 8, Clearblue at Dawn’s at 9, The Jack Project at the Cow and a DJ upstairs at the Rueb. The fifth annual Jingle Bell Run/Walk will be held this Saturday. It's a charity event, with all registration fees going to the Northfield Area Family YMCA. Saturday is going to be a great day to be outside, with the weather forecast of sunny skies and the temperature in the 30's. Enjoy live music, a horse drawn wagon, free jingle bells, holiday treats and a free 2006 Jingle Bell Run t-shirt. Also free holiday stockings will be given to all family run/walk participants with stocking stuffers handed out along the route. Registration starts at 8 a.m. in the Northfield Armory (519 Division Street) with the race starting at 9 a.m. More details can be found at the Jingle Bell Run/Walk website. The event is sponsored by Carlson Capital Management and Fifth Bridge. If you are looking for organic food, food produced locally, products without additives, natural health and body care products, and eco-friendly housewares, you can find them at Just Food Co-op. This weekend, the Co-op celebrates its second anniversary with an anniversary bash on Saturday, December 16. The Northfield Wine Club will hold our final event of the year, this Thursday, December 14, from 7:00 to 9:00 p.m. at The Grand, featuring Wines for the Holidays. As usual, we will be offering a variety wines from around the globe, with special emphasis on styles best suited for holiday entertaining and food pairing. Come all ye faithful, and sample some bubbly, along with stylish and affordable whites and reds, with even a little sherry thrown in for good measure. This collection of Holiday Wines will be accompanied by an assortment of cheeses courtesy of Just Food Co-op, and baguettes from Brick Oven Bakery. Northfield.org would like to take a moment to thank our generous sponsors, who have agreed to match the contributions of our new members. Please take a good look at the list, and remember the names when you're doing business here in town. Their generosity continues to help Northfield and Northfield.org become a better community. Northfield Public Library starts its own info blog! Do you ever wonder when storytimes are? When First Steps is open? What's the latest news on Booker? 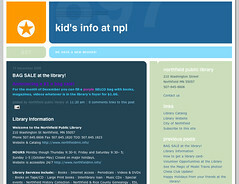 Now you can click either from the library's website www.northfieldmn.info or go directly to the library's own info blog by clicking on the image or this link to www.selco.info/norpl. Have fun and keep informed the easyway! Kathy Ness is a children's librarian at Northfield Public Library. Tis the season for fun—and for the Northfield Citizens Online annual meeting. We will be gathering at 7 p.m. Wednesday, Dec. 13, at Carlson Capital Management to share a toast to another great year, another as we elect and install our new board members, another as we honor and thank our outgoing board members...you get the idea. Let's just say it won't be a boring business meeting. Last night's Winter Walk was cold but seemingly more popular than ever, according to our old friend Griff Wigley, who sent us the photo at left. You can see the 50+ photos he took on Locally Grown. NEW Birds Eye View map available during Winter Walk! 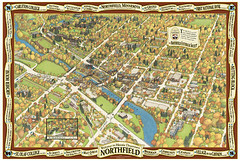 The first Bird's Eye View of Northfield since 1888 will be available for people to order at the Northfield Historical Society during tonight's Winter Walk. We are the only place in town that will be selling the prints! Be the first to get your hands on the new map, which was created by Jim Bonhoff. It took him over 14 months to complete the map. We invite you to get your order in before the holidays and be one of the first people to get this new piece of Northfield History! Hayes Scriven is the Executive Director of the Northfield Historical Society. The 'Sphere ish back and we're got that... uh... thing, 'cause it's Repeal Day today wooooooooo! Yeah! We wuz jusht sitting here and we were all like "We should totally write that Blogostuff 'cause, it's like, due, man." And I was like "That's the besht idea I've heard all night" and then that waitress came by, you know the one... yeahhh, you know the one... and we ordered another pitcher, 'cause it's Repeal Day! Wooooooo! The Sphere is back!